Alciato at Glasgow: Emblem: Ire. Section: FOLLIE. View all emblems in this section. Fureur s’esmeut que raison point ne dompte. me en beste furieuse qui se nuyct à elle mesme. 1. The Greek word ἀλκαία was supposedly derived from ἀλκή ‘strength’ (see emblem 3, [FALb003]). The Etymologicum Magnum, an ancient Greek lexicon, defines ἀλκαία as ‘properly the tail of the lion, because it urges him on to strength (ἀλκή)’. Pliny, Natural History, 8.16.49, describes how the lion’s tail lashes with increasing fury and spurs him on. See also Aelian, De natura animalium, 5.39. Emblematum libellus (1546), Venice: Ira. Los Emblemas (1549), Lyon: La Ira. Diverse imprese (1551), Lyon: Ira. Emblematum libri II (Stockhamer) (1556), Lyon: Ira. 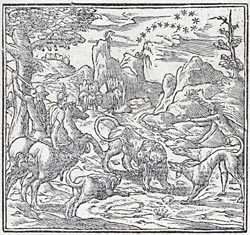 Toutes les emblemes (1558), Lyon: Ire. Liber emblematum ... Kunstbuch (1567), Franckfurt am Main: Ira. Zorn. Emblemata / Les emblemes (1584), Paris: Ira. Cholere . Declaracion magistral sobre las Emblemas de Andres Alciato (1615), Najera: IRA. Les emblemes (1615), Geneva/Cologny: La cholere.